I don't tend to hang out much by the roots-from-the-earth bins in the vegetable section of the grocery store - probably an aversion to dirty things that look like they'd make better weapons in a neighborhood snowball fight than something sane humans would consider eating. But this one spoke to me. Maybe "spoke" is the wrong word. It whispered. In the dulcet tones that only a bunny-rabbit-shaped root-like thing could muster. Call me smitten. Call the person behind me confused as I lined up the shot and smiled limply at her, the same smile I seem to flash every other confused stranger who happens to be nearby when I get that photographic inspiration and start snapping away. Hop on, little buddy. Looks like I'll be back in this part of the store before long. Your turn: Am I imagining things or do you see it, too? I think you've got ginger-itis, Carmi! 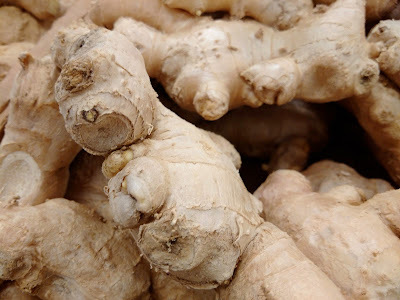 Carmi, you can make wonderful and yummy things with this funny (ginger) root. Last week I grated it for an Exotic Fruit Jam and a yummy Pineapple Chutney. Last year I made a Ginger Chutney. I kept the peels of the ginger root, and after washing it thoroughly, placed it in 5% vinegar solution, and let it sit for about three months. Strain it, and voila, you have the best ginger vinegar you've ever tasted! Enjoy. I see it (actually, I see several faces) and it is reminding me that I still need to buy fresh ginger and lemon to slice up and add to local honey. That will sit in a mason jar in the back of my fridge as the flavors blend, waiting to be scooped out by the spoonful and added to a mug of steaming hot water -- hopefully to avoid getting a bad cold this winter.